It took me a lot of years to realize that when you're a girl, you can dress up as much as you want and still pull of casual. 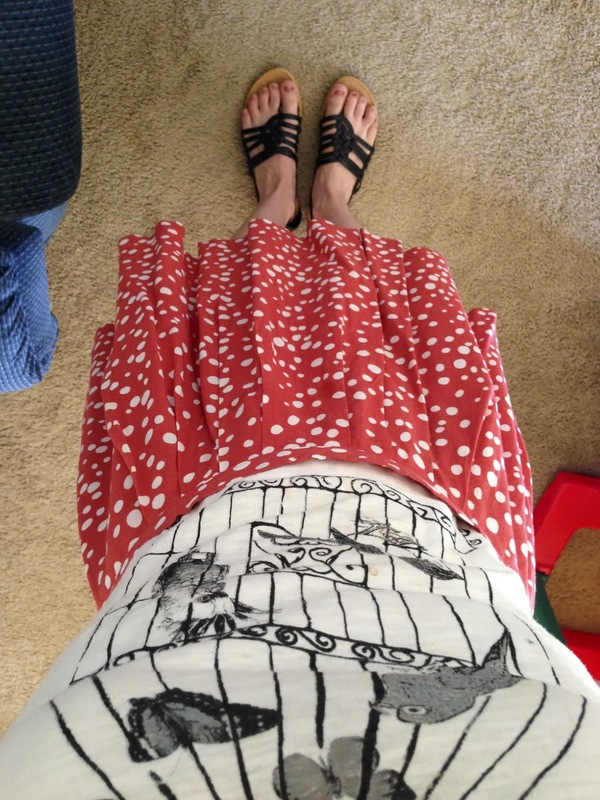 I never wore skirts to high school or college classes, and now I wear skirts all. The. Time. Why do I love skirts? 1- They are so feminine! I love dressing girly and pretty for no reason at all. 2- They always make an outfit look put together, and it's easy to keep it from looking like you're trying too hard. 3- I mean, when it comes to the comfort battle between tight pants or a skirt... skirt will win every time! Especially in Texas where the breeze offered by a skirt can be a life saver in the summer. 4- They are so versatile. A good skirt can create SO many new outfits. Add a belt. Add a scarf. Wear it with one of your zillion shirts. Pull it up to your waist and wear it with a short shirt that doesn't fit well with pants and you had all but ruled out. Simple and pretty are surely 2 of my momiform requirements, and skirts are my favorite "fake fancy" go to! Do you wear skirts on a regular basis? I definitely didn't used to until I discovered their power and comfort. You should look here to find the best ideas for your persuasive paper. Isn't this great? Don't worry and just visit at StudentsAssignmentHelp.com. We team of masters and Ph.D. experts working with the great knowledge in the field study and make sure you score higher grades ever. Are you demanding for the My Assignment Help services from professional experts then visit website now.